A woman I know once told me that she grew up on mangoes & rice. And she meant it literally. She grew up in the Philippines where both rice and mangoes are abundant – and she was a super fussy eater. But… she LOVED mangoes and rice. As such, mangoes & rice were what she predominantly ate for breakfast, lunch & dinner. So while the rest of us may think of rice & mangoes as a dessert, they were her staple. I remember thinking to myself something along the lines of “that couldn’t have been very healthy.” But there she was, standing in front of me…looking healthy and of normal height. So much for any stunted growth thoughts that might have sneaked into my brain. Hmmm. Mango Nutrition – Beautiful Inside & Out! Let’s talk mangoes & the 9 essential amino acids. Most everyone understands that through one’s diet, if one doesn’t get the essential amino acids, something is going to go amiss on the health front. Mangoes are interesting from that perspective. 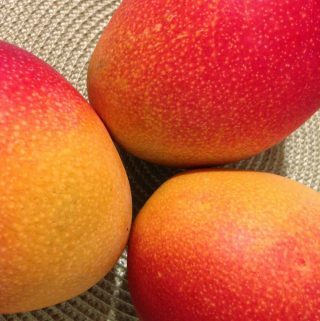 While one serving of mango (1 cup) doesn’t have *high quantities* of any of the essential amino acids, the distribution among the 9 is very respectable, being low in only one area: Methionine Cysteine – aka M + C. And wouldn’t you know it, but breakfast grains & cereals (including white rice!) 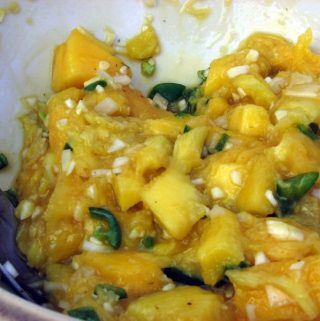 are one of the recommended complements to a food low in M + C. So when you put mangoes & rice together, you have the 9 essential amino acids covered! Crazy stuff, huh? For those of you interested – here’s a list of the 9 essentials: Check them out on Wikipedia or some other source – to go into detail about each is definitely beyond the scope of this post. A respectable 3.0 grams of fiber – which amounts to 12% of the Daily Value for the average person. low in the bad boys: saturated fat, cholesterol & sodium. So my pal who grew up on mangoes & rice wins the prize for surprising us all! Vegetarians & vegans are *great* at combining foods to make a complete essential amino acid profile. But I bet there aren’t too many of them out there who would think about mangoes & rice for said purposes. Thanks to my mango gal pal for inspiring me to look into the mango/rice combo and for helping me to change my thinking about mangoes as a source of nutrition beyond the obvious – “high in Vitamin C – high in fiber” mantra. Previous Post: « Mango Recipe: Mango Banana Rum Muffins – A Mango Recipe You DON’T want to miss.